My teenage son is the BBQ guru of the Foodie Quine household so he was very much in charge of the cooking of this dish - I was just the creative genius behind it all and of course as always will take all the glory on social media ;-) We cooked these on a Weber BBQ with Oxford Charcoal Company charcoal and Weber Apple Wood Chips soaked in apple juice. The pork loins were very briefly seared on both sides over direct heat before being transferred to indirect until they reached the magic internal temperature of 71 In addition to being topped with Percy, they were also sprayed with apple juice whilst cooking. 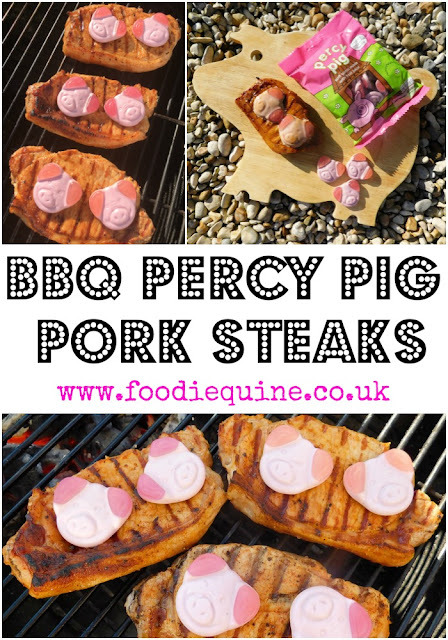 Pork + Apple + Percy Pig = Porcine Heaven! Soak the apple wood chips in a 50:50 mix of apple juice and water for at least 30 minutes. Pre-light charcoal with a chimney starter. Tip all of the lit charcoal into one side of the barbecue. Squeeze the wood chips to remove excess moisture and sprinkle on top of the charcoal. Allow the grill to come up to temperature. Meanwhile rub the pork loin steaks with salt, pepper and smoked paprika and pour some apple juice into a spray bottle. Sear the pork on the BBQ for 1-2 minutes (or until they release naturally) on each side over direct heat with the lid closed. Move to indirect heat to continue cooking. Place two Percy Pigs on the top of each pork loin steak. Continue to cook with the lid closed until an internal temperature of 71 is reached, spraying occasionally with the apple juice. Keep an eye on the Percy's to make sure they don't slide off! The soaked wood chips can be used in a barbecue smoker box or placed in a pouch of tinfoil with holes stabbed in it. Sear the pork initially directly over a high flame then move off the heat to an adjacent switched off burner whilst keeping the original burner switched on. Keep the lid closed throughout the cooking process. Percy pigs on pork steaks? Please tell me this post was actually scheduled for April 1st? I can just imagine my grandchildren's tears when they saw what was happening. Absolutely not a joke! Why would your grandkids cry? Would they not be eating Percy anyway whether or not he was on top of a pork chop?! Ooh what a unique idea. I get what you're saying about gammon and pineapple so I can imagine this being tasty. I thought the percy pigs would melt a bit more to be honest! I love pork and love the apple elements to your recipe. They still pretty much kept their piggy shape but some did have a tendency to try and slide off!